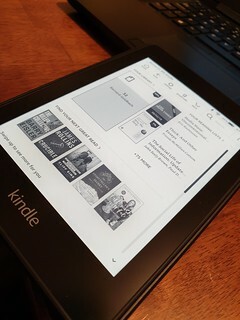 AMAZON OFFERED REDUCED pricing for the Kindle Paperwhite and I jumped at the opportunity to buy a 32 GB model with its Bluetooth service for the Audible collection I have amassed. I like the lightweight feel and quick touchscreen responsiveness of the Paperwhite. I don't think I will be using its waterproof capability to read in the bathtub or Jacuzzi.